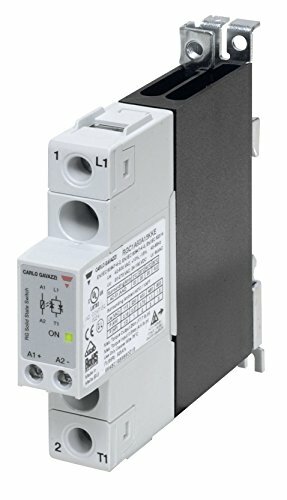 17.5mm wide Solid State Relay/Contactor snaps right onto DIN rail, and provides a silent means to switch loads on and off. There are no moving parts, so there are no contacts to ever replace. This model can switch up to 20 Amps AC/3 horsepower for single phase loads at ambient temperatures of 104 degrees Fahrenheit. For higher temperatures, this maximum rating decreases. This device can switch up to 600 VAC and is controlled by a 4 to 32VDC input signal. Diagnostic LED simplifies installation and troubleshooting. If you have any questions about this product by CARLO GAVAZZI, contact us by completing and submitting the form below. If you are looking for a specif part number, please include it with your message.